It has been so cold in London this winter. So on my recent trip to the grocery store when I found pots of kitchen herbs on sale, I got this sudden urge for fresh, green, infusions! I live in the city, in an apartment, without any outdoor space, so these little pots of herbs are living on my kitchen windowsill. I’m not sure how long they’ll last, since I’m snipping little bits off everyday to make cups of tea. What I love, love, love about herbal infusions is that they are quick & easy to make. They’re inexpensive. They taste yummy. And they nourish your body with lots of herbal goodness. Especially during the deep, dark of winter, a bright and cheery thyme and lemon infusion hits the spot. But even more wonderful… did you know that thyme is a powerful herb traditionally used for colds and flus? Oh yes. This tea is actually a redo of my very first post on VintageAmanda, about making thyme tea. What’s so special about thyme? Everyone knows thyme. It’s one of the common kitchen herbs that’s probably in your cupboard right now. But did you know that thyme is also potent medicine? Based on traditional usage, thyme is antibacterial and antiviral. It’s especially noted for it’s use in respiratory infections and as an expectorant. That’s why it’s perfect for this time of year … it’s great if you have a cold or are feeling run-down AND everyone has it in their cupboard already. Note – traditional usage says to avoid large doses of thyme during pregnancy. But won’t my tea taste like stuffing? Well, that’s up to you to decide. Using fresh thyme changes the taste completely. And once you add some honey and lemon (or a spoonful of our Vietnamese Honey and Lime Syrup), I think you’ll find it’s warming, aromatic and comforting. If you have other questions, check out our comprehensive page on how to make herbal infusions. For this infusion, in particular, the type of thyme you choose (dried or fresh) and the amount of time you steep it, will really impact the taste. 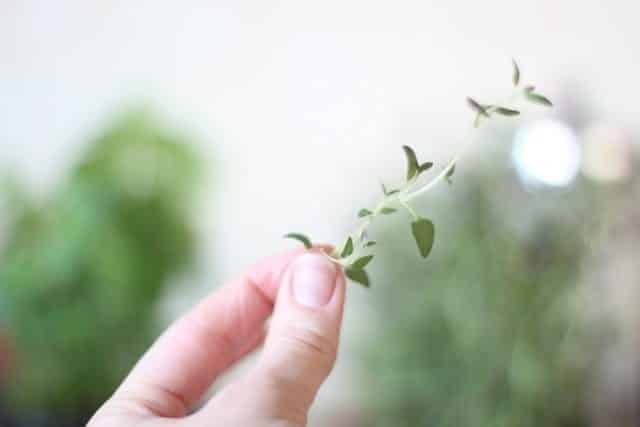 Dried thyme is very strong, and if you let it infuse for a long time, you’ll get a powerful infusion! If you have a cold and want to kick it, go ahead and make yourself a super strong infusion. But if you’re just drinking this as a warming winter infusion, I’d make it with fresh thyme, or don’t let it steep as long. Fresh versus dried thyme. Which looks more appealing to you? 2. Put your thyme into your brewing container (learn more about brewing containers here). 3. Pour the just boiled water over the thyme. Now COVER your container, and let it brew from 5-10 minutes. 4. Pour into your teacup. 5. Add a slice of lemon and a spoonful of honey. Enjoy! Have you ever made thyme tea? What are your favorite winter herbal infusions? Let us know in the comments! I was introduced to the combination if fresh thyme (small handful), sweet orange (2 slices) and honey as a tea in Germany. Only now have I found out on the internet that this is likely a traditional cold remedy, as our host hadn’t happened upon it himself. Your site has just reminded me of it–thanks! I’m supposed to stay away from honey, do you think organic raw agave would be a suitable substitute? Yes agave would work, or maple syrup. I aslo make parsley, thyme, sage, rosemary infusions with added Manuka honey. I drink an infusion of rosemary and thyme with a bit of lemon which is also delicious. It always makes me feel great, I’ve never looked in to why but I love it. It’s also great for steaming your face! I LOVE rosemary infusion. So refreshing. I’ve had hot water with lemon and with honey but this sounds really nice! I will keep it in mind for cold/flu/winter blahs. Let me know how you like it when you try it!